These factors resulted in Mid-State’s securing a contract to manufacture four separate components for a large off-road military vehicle. The company invested $13 million to outfit, equip and expand a new 76,000-square-foot production facility, in order to support this program. Mid-State added 5-axis CNC-controlled rotary tables to each of these horizontal machining centers, to help eliminate setups. On one particular stainless-steel part with 800 distinguishable features, Mid-State was able to eliminate one CNC machine operation, a manual operation, the peripheral milling operation and hand-polishing. Cycle-time reductions range from 35 to 80 percent, and the Makino equipment has allowed Mid-State to routinely produce hundreds of these large part production components on a monthly basis. The dual fifth-axis tables have helped to decrease cycle times by eliminating setups. The company also uses hydraulic fixturing and automatic probes to increase the overall productivity of the operations, while reducing the potential for human error. The BTSOMA sensors that detect broken tools and extend tool life also improve the production process and ultimately increase quality. Labor has also been reduced. Previously, the company assigned one operator per machine. Now it only needs one operator for every two machines—allowing it to complete more work in the course of a day, with the same number of people. 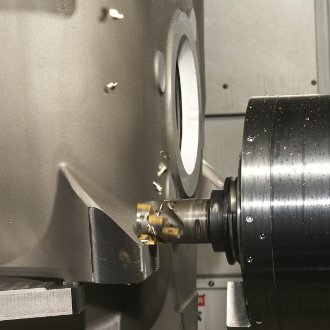 With the new horizontal machining centers, Mid-State is able to deliver higher-quality parts more expediently than ever before. Now the only factor slowing things down is waiting for raw materials to arrive at the facility.